Sometimes you purchase a Persian carpet that you absolutely love, just to place it in your home and find that it slips. The reasons can vary from the thickness of the carpet to the type of flooring you have and mostly it is a combination. Thin carpets are less likely to stay in place especially on a wooden or tile floor. To resolve this underfelt can be placed under the carpet. It will prevent it from moving and add some thickness. We do not recommend using plastic underlay as it often melts from the South African heat or underfloor heating and will cause extensive damage to both your carpet and floor. At Ghorbany Carpets we have washable underfelt available that are cut to size on site. Carpets that are woven too tight often have curling edges. A practical solution for this is to attach a leather strip to the sides and the weight will pull the edge down. At Ghorbany Carpets we offer this service. Contact us for more information. 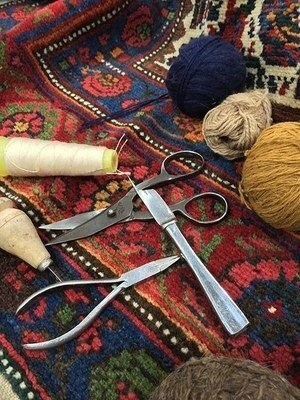 Persian carpets are made with vegetable dyes and although the dyers do their best to ensure that the dyes are set, some batches may not be that steadfast. This could result in colour running in some carpets, especially when it gets wet. The good news is that colour running can be fixed by knowledgeable carpet repairers in most cases and at Ghorbany Carpets we offer this service. Contact us for more information. Liquid spilling – scoop as much of the liquid up with a spoon and place a towel underneath the spot. Dab the spot on top with a white cloth or towel to remove more of the liquid. Rub the stain with only the foam of sunlight liquid and a white cloth until it is removed. Let the carpet dry in the sun. Repeat the last two processes if necessary. Solid spilling – remove the solids and rub the stain only with the foam of sunlight liquid and a white cloth. Let it dry in the sun. Repeat the steps until the stain is removed. Our African sun is really hot in summer and the colour of Persian carpets exposed to extensive direct sunlight might fade over time. To prevent this we recommend that you change the direction of the carpet often. If, however, the damage is done Ghorbany Carpets offer the service of fixing your carpet’s colour. Give us a call.